Congratulations! Our members Po-Chen Wu (吳柏辰) and Shih-Yi Wu (吳思儀) had the honor to win the NTU GIEE (台大電子所) Best Ph.D. Dissertation Award (最佳博士論文獎) and Best Master's Thesis Award (最佳碩士論文獎), respectively! Congratulations! Our member Po-Chen Wu (吳柏辰) had the honor to win the Chinese Image Processing and Pattern Recognition Society (中華民國影像處理與圖形識別學會) Best Ph.D. Dissertation Award (博士論文優等獎)! Congratulations! Our paper "Vehicle re-identification with the space-time prior", authored by Chih-Wei Wu, Chih-Ting Liu, Cheng-En Chiang, Wei-Chih Tu, Shao-Yi Chien was accepted by the CVPR Workshop (CVPRW) on the AI City Challenge in 2018 and also won the 2nd place in this Nvidia AI City Challenge Track3! Congratulations! Our paper "Learning Superpixels with Segmentation-Aware Affinity Loss", authored by Wei-Chih Tu, Ming-Yu Liu, Varun Jampani, Deqing Sun, Shao-Yi Chien, Ming-Hsuan Yang, and Jan Kautz was accepted by the top conference, IEEE Conference on Computer Vision and Pattern Recognition (CVPR) in 2018. Congratulations! Our paper "DodecaPen: accurate 6DoF tracking of a passive stylus", authored by Po-Chen Wu, Robert Wang, Kenrick Kin, Christopher Twigg, Shangchen Han, Ming-Hsuan Yang, and Shao-Yi Chien was accepted by the top conference, ACM User Interface Software and Technology Symposium (UIST) in 2017 and had the honor to win Honorable Mention Award! Congratulations! Our paper "Learning to compose with professional photographs on the web", authored by Yi-Ling Chen, Jan Klopp, Min Sun, Shao-Yi Chien, and Kwan-Liu Ma was accepted by the top conference, ACM Multimedia in 2017. Congratulations! Our paper "Occlusion-aware video temporal consistency", authored by Chun-Han Yao, Chia-Yang Chang, and Shao-Yi Chien was accepted by the top conference, ACM Multimedia in 2017. Congratulations! Our paper "Unrolled Memory Inner-products: an abstract GPU operator for efficient vision-related computations", authored by Yu-Sheng Lin, Wei-Chao Chen, and Shao-Yi Chien was accepted by the top conference, International Conference on Computer Vision (ICCV) in 2017 and selected as spotlight paper! Congratulations! Our paper "Track-clustering error evaluation for track-based multi-camera tracking system employing human re-identification", authored by Chih-Wei Wu, Meng-Ting Zhong, Yu Tsao, Shao-Wen Yang, Yen-Kuang Chen, Shao-Yi Chien was accepted by the top conference, Computer Vision and Pattern Recognition (CVPR) Workshops in 2017. Congratulations! 恭喜簡韶逸教授當選中華民國第54屆十大傑出青年(Ten Outstanding Young Persons Award of Republic of China)! 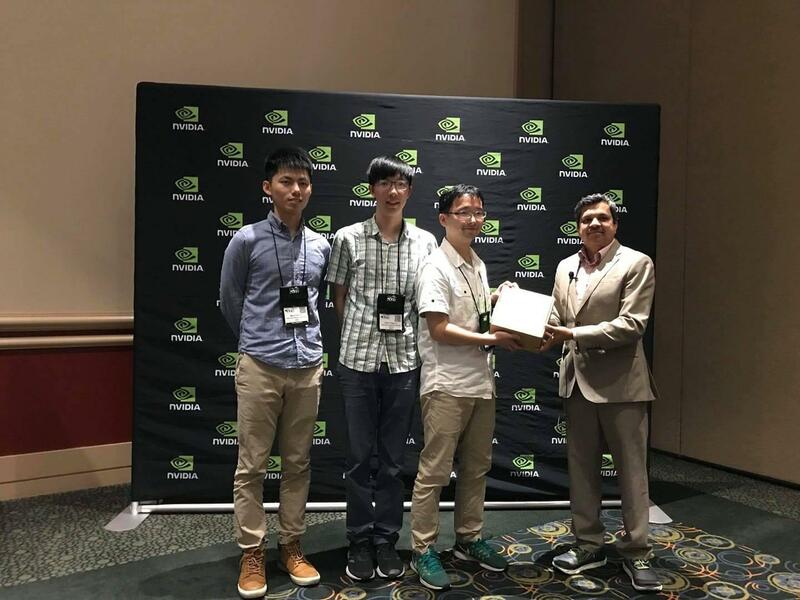 Congratulations！ Our team had the honor to win "Intel Labs Distinguished Collaborative Research Award"
Our member Chieh-Chi Kao has the honor to win the 3rd prize, Youth Thesis Award of Chinese Institute of Electrical Engineering (CIEE), Taiwan (2012年「中國電機工程學會-青年論文獎」). Our paper "Configurable Pixel Shader Workload Reduction Technique for Mobile GPUs" authored by Yu-Jung Chen, Jong-Chyi Su, Chia-Ming Chang, Yen-Chang Lu, and Shao-Yi Chien was selected as 1st student paper award of IEEE Global Conference on Consumer Electronics 2012. Our member 賴瑞欣 陳潔立 吳柏辰 高介其 has the honor to win the NTU Outstanding Student Scholarship (台大100學年度傑出表現獎學金). Our project "Tennis Real Play (TRP)" was featured in NewScientist. 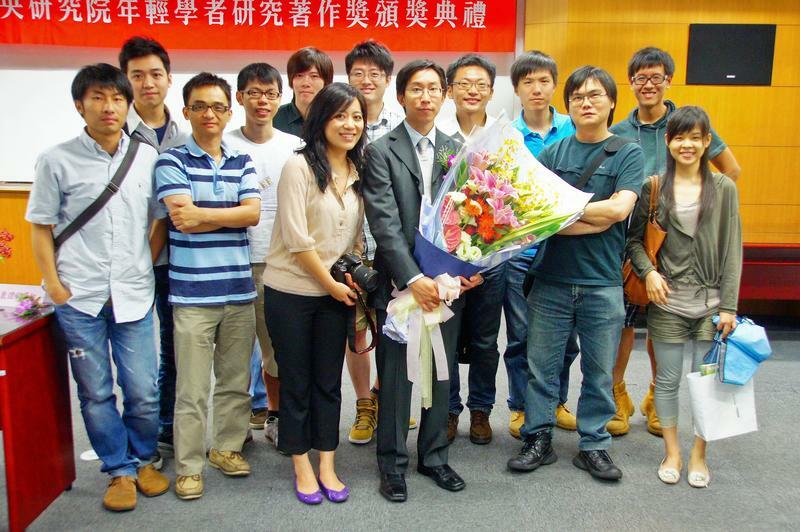 Our member 洪崇耀, 丁柏舜, 李承軒, 陳宥融 has the honor to win the Second Place of 2011 CUDA Programming Competition (2011 台灣 CUDA 程式設計比賽). Prof. Shao-Yi Chien has the honor to win the Award for Junior Research Investigators of Academia Sinica (2011年「中央研究院年輕學者研究著作獎」). Our paper "A psychophysical analysis on perceptual limitation of motion-image-artifact reduction using 120-Hz displays" authored by Ya-Ting Wang, Yi-Nung Liu, Shao-Yi Chien, Yung-Hao Yang, Yi-Lin Chen, and Su-Ling Yeh was accepted by the top conference, SID International Symposium (SID 2009). 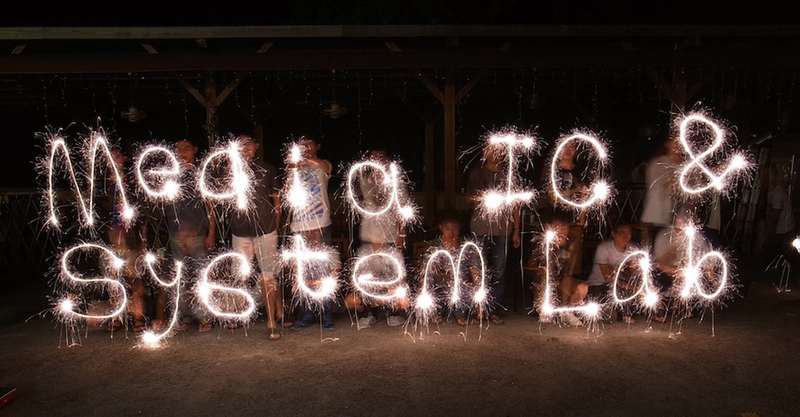 Our paper "CRISP-DS: dual-stream coarse-grained reconfigurable image stream processor for HD digital camcorders and digital still cameras" authored by Tsung-Huang Chen, Jason C. Chen, Teng-Yuan Cheng, and Shao-Yi Chien was accepted by the top conference, IEEE Asian Solid-State Circuits Conference (ASSCC2009). Our paper "Tera-scale performance image stream processor with SoC architecture for multimedia content analysis" authored by Tse-Wei Chen, Chi-Sun Tang, Sung-Fang Tsai, Chen-Han Tsai, Shao-Yi Chien, and Liang-Gee Chen was accepted by the top conference, IEEE Asian Solid-State Circuits Conference (ASSCC2009), and is selected as the Technical Paper Focus. Prof. Shao-Yi Chien has been accepted for promotion to Associate Professor, Congratulations!! Our paper “An asynchronous fixed-coefficient FIR filter implemented with flexible a-Si TFT technology” authored by Jiun-Ying Bai, Hau-Ru Chen, and Shao-Yi Chien was selected as the Best Paper Award Candidate of the 19th VLSI Design/CAD Symposium. 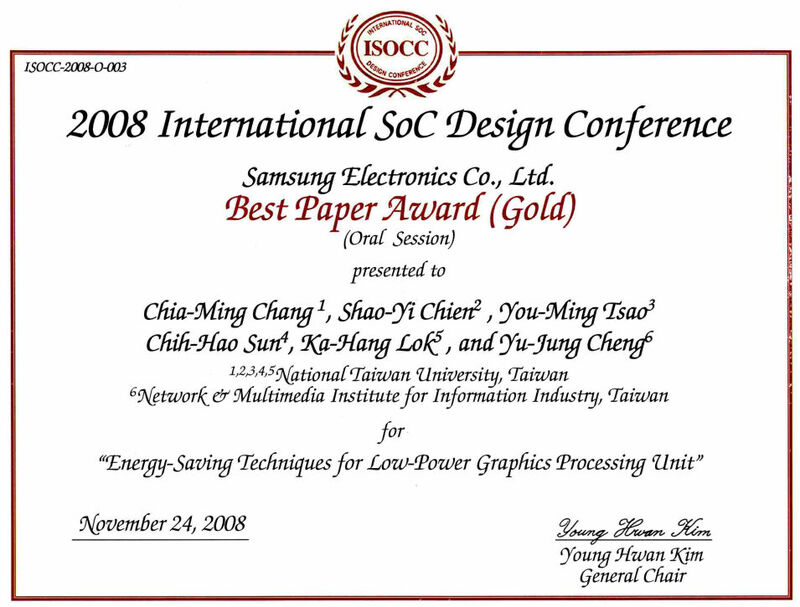 Our paper “Low power multi-core stream processor for mobile multimedia applications” authored by Chih-Hao Sun, You-Ming Tsao, Ka-Hang Lok, Yu-Cheng Lin, Chia-Jung Hsu, and Shao-Yi Chien got the Best Paper Award of the 19th VLSI Design/CAD Symposium. 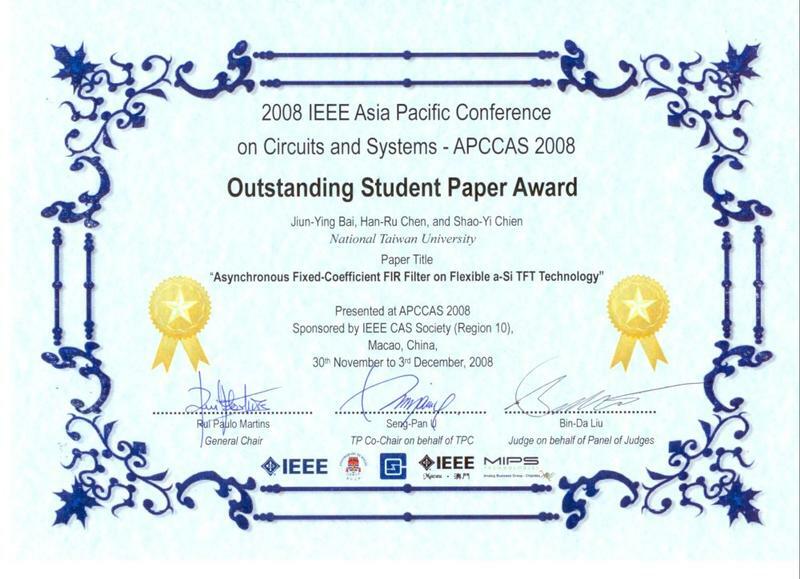 Our paper “A 2.88mm2 50M-Intersections/s Ray-Triangle Intersection Unit for Interactive Ray Tracing” authored by and Chen-Haur Chang, Chuan-Yiu Lee, and Shao-Yi Chien was accepted by the top conference IEEE Asian Solid-State Circuits Conference (A-SSCC) 2008. Our design “A 16mW 6.4GFLOPS multi-core stream processor for mobile multimedia applications” authored by You-Ming Tsao, Chih-Hao Sun, Yu-Cheng Lin, Ka-Hang Lok, Chia-Jung Hsu, Shao-Yi Chien, and Liang-Gee Chen was presented in the top conference Symposium on VLSI Circuits 2008. Our paper “Coarse-grained reconfigurable image stream processor for digital still cameras and camcorders” authored by Jason C. Chen, Chun-Fu Shen, and Shao-Yi Chien was selected as the Feature Article of CICC 2007. Our group “Media Wisdom King” (媒體智慧王) won MXIC 6th GOLDEN Silicon Awards (金矽獎) for Application Excellent-Award(應用組優等).